At times barely visible due to machine-generated smoke, Frank Reyes serenaded hundreds of Latino couples whose bodies were bathed in the multicolored lights in a nightclub above a car dealership. Women in tight dresses danced with men in blue jeans as Reyes, who bills himself as “el principe de la bachata,” sang the music that made him a household name in Dominican and Puerto Rican communities. His nickname means “prince of bachata,” an increasingly popular type of music defined by lyrics about heartbreak. Reyes has released countless viral music videos and even played Madison Square Garden. Despite those credentials, he was performing at 3 a.m. on Wednesday, his voice drowning out the clacking of high heels at La Boom nightclub at 56-15 Northern Boulevard, in an area few would expect to host an international celebrity. Queens has become a fixture on the bachata circuit, thanks to Latino communities in Corona, East Elmhurst and Woodside. Madison Square Garden may still be the best spot in the city to catch Jay Z or Bruce Springsteen, but fans will find many of the world’s most famous bachata singers in Queens, playing clubs ranging in capacity from several hundred to about 1,500. La Boom isn’t the only stop for bachata royalty. Reyes, for example, will perform again on Feb. 23 at the Jubilee Restaurant Lounge on 94th St. in East Elmhurst. 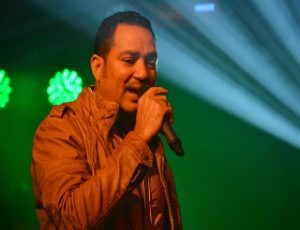 Another bachata star, Raulin Rodriguez, will play Maracas New York nightclub on Jamaica Avenue in Richmond Hill on Feb. 19. Such concerts are weekly if not daily occurrences in the borough. In the light drizzle outside La Boom before Reyes’s recent performance, Alexandra Ahumada said that Queens bachata concerts allow clubgoers to hang out with friends within a few feet of singers who create the soundtracks of their lives. Club performances also offer a release for bachata fans who say they would feel restrained in larger venues where crowds typically sit and watch a singer rather than dance. Frank Reyes. Photo by Nicholas Hirshon. But the rhythm struck a chord with younger audiences. Bachata broke through internationally after singer Juan Luis Guerra won a Grammy for his band’s 1990 album “Bachata Rosa.” The genre has since yielded a slew of stars whose posters hang on the walls of Latino households across the city. Bachata’s most famous heartthrobs, such as Prince Royce and lead singer Romeo Santos of the band Aventura, now hit up venues larger than what Queens can offer, though they did play there often as beginners. Still, Queens crowds can hear singers just a rung below those superstars on a regular basis. Most Queens clubgoers were born decades after bachata was created and won gradual acceptance, at least in the United States, so they may not realize the stigma still attached to it in the Dominican Republic, Hernandez said. Others are too passionate about bachata music to care about the dismissive opinions of others. At Reyes’s concert at La Boom, men and women were still piling in after 2 a.m. Security checked their IDs beneath a black awning, and couples ascended an outdoor staircase to the second-floor club. They turned over tickets that had cost $30 in advance or $45 at the door. Inside, dozens of men held up smart phones to record the performance, jostling for prime position. Women alongside the stage gleefully screamed for Reyes, extending their hands as if to touch him. He was beyond their reach, but smiled widely in return. Playing at neighborhood nightclubs makes financial sense for bachata singers. In a typical month, Reyes can make $700,000 with about 30 to 40 parties at nightclubs, Cabrera said. Reyes could command higher individual rates by playing large venues, but Cabrera said the occasional nature of the concerts makes them less profitable as a whole for bachata stars. Diaz’s brother, Dario, said he thinks the singers enjoy the intimate performances just as much as fans do. “They feel the same excitement looking out into the audience and seeing everyone dance,” said Diaz, 36, of Ozone Park. He laughed when asked what else lures him to bachata concerts in Queens.“You love the selection of women that show up,” he said.